Cherilyn Nocera-Newland, professional photographer and owner of Nocera Photographic, won the prestigious “Best in Show” award in the portraits category at the 2013 Florida Professional Photographers Association (FPPA) Convention for her photograph, “Redneck Yacht Club.” At the convention, held in Orlando from August 17-21st, this family portrait also won first place in the environmental portraits category, while her photograph, “Great Sand Dunes, Colorado” won first place in the abstract category. 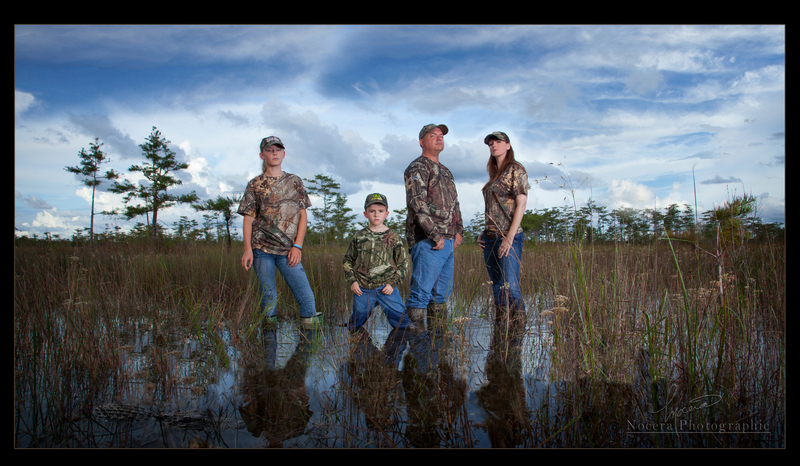 “The concept came to me to do an Everglades family portrait for my more adventurous clientele, so I put an announcement out on Facebook,” says Cherilyn Nocera-Newland of her award-winning portrait. “The family I selected for this portrait is from Cape Coral, and the Everglades was the perfect setting to capture the essence of their family dynamic. I jumped at the opportunity to do something different,” Cherilyn adds. Cherilyn Nocera-Newland, owner and operator of Nocera Photographic in Cape Coral, has been a professional photographer for over two decades. She is certified by the Professional Photographers of America (PPA) and earned the prestigious Photographic Craftsman and Master of Photography degrees, which recognize her superior photographic quality and success in photographic competition, as well as her efforts in speaking and mentoring in photography. In addition to her Florida Degrees of Photographic Excellence and Education, she was also awarded the FPPA Florida Service Award. In 2012, she received the “Photographer of the Year” distinction from the PPA. “I love capturing the spirit and personality of my clients. The members of this family are huge Seminoles football fans, so they loved the idea of hunting for gators. This photograph really shows that energy and attitude,” says Cherilyn. Nocera Photographic is a full service, in-house photographic studio specializing in family portraits, children and infant portraits, high school senior portraits, maternity photographs, and painted portraits. The studio offers consultations, session viewing, custom framing, custom invitations and announcements, and full retouching/manipulation capabilities. Cherilyn Nocera-Newland, award winning and PPA certified professional photographer, concentrates on capturing the true essence of her subjects and preserving special moments that last forever. The studio and gallery is a converted model home, located at 419 Santa Barbara Blvd. in Cape Coral, FL. For more information, visit www.noceraphotographic.com.